Remember when everyone was up in arms because the Nexus 6P and 5X were so expensive outside North America? It turns out that Google has decided to quietly fix that, at least in some parts of the world. 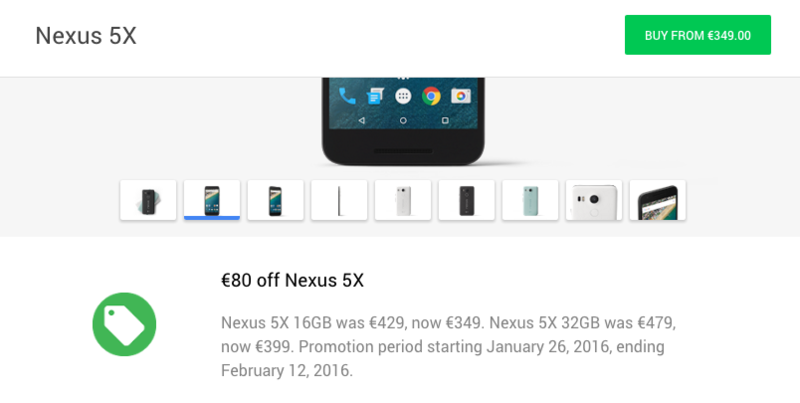 On the Google Store, the Nexus 5X, which initially launched for €479 and then came down to €429 in the Eurozone, is now starting at just €349, while the Nexus 6P, priced at €649 back in September, now begins at €549. The prices in Italy are still €50 more expensive for every model than the rest of the Eurozone, and the price increments for each storage tier are the same as before. Google is definitely eating away at its margins here — shipping costs still exist, and the weak euro exchange rate doesn't help either. And when you also take into consideration that these prices all include taxes (unlike the prices on the US Google Store), you begin to see that this is quite an attractive bargain. These prices only last until February 12, so if you were still thinking of buying a new Nexus, now is the time to hurry up and do so. Update: It looks like Finland, while certainly part of the Eurozone, doesn't appear to benefit from this promotion.